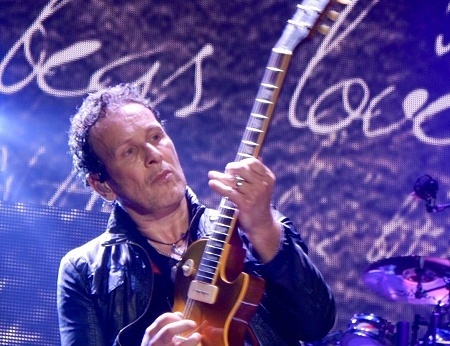 Def Leppard guitarist Vivian Campbell was interviewed in February about Last In Line and the full audio is available. Vivian spoke to Kris Engelhart of Backstage Axxess on 28th February. Vivian talked about his current health, Last In Line, the Heavy Crown album, DIO, second Last In Line studio album, his memories of playing in Buffalo/Darien Lake, older bands not releasing new music, 2017 North American tour, playing festivals, live hologram shows and his (small) dog Stuart. Vivian says the band will work again with producer Jeff Pilson but are unable to work with him until September meaning the album will not be released until 2018. Listen to the full 14 minute interview below. "We are actually, when I'm done with this interview and another couple I have this morning. I'm heading down to rehearsal. We've been working on songs. We've got a lot of great ideas for it already. You know it's been a bittersweet sort of experience, this whole thing, because obviously we lost Jimmy Bain a month before the Heavy Crown came out last year and you know Jimmy was so much a big, big part of this and it was really difficult to consider going on without him." "But you know after a while we decided to do that and we've been very fortunate that Phil Soussan was able to work with us on this. Phil was also a friend of Jimmy's and a peer of his and play's in a very, very similar style and really kind of understands the ethos of this band and the sound that we're going for and the writing style that we have. So I'm happy to report that it's been working out really, really well with Phil in the band." "Well that's the thing, we wanted to keep. We worked with Jeff Pilson as producer on Heavy Crown and Jeff was absolutely, he's a great, great producer and he was so perfect for this project. So we wanted to work with Jeff again. Unfortunately the schedule with Def Leppard and Jeff's schedule with Foreigner, it's gonna be September before we can actually go into the studio to make the record." "I would say we've probably got about two thirds of the record written already, but like I say it's gonna be September before we can start to record. So I'm looking at an early 2018 release for it."